Merlin High Sleeper with Desk, Grey Star | Great Little Trading Co.
Made from: Bedframe, Desk and Sofa Frame: Solid wood frame with MDF Panels & pine slatted bed base. Sofa Bed Cushions: 100% Cotton Cover with foam cushion pads. Washing instructions: Cushion covers are spot clean only, due to the flame resistant finish on the reverse of the cover fabric. This complies with Furniture & Furnishings (Fire) (Safety) Regulations 1988. 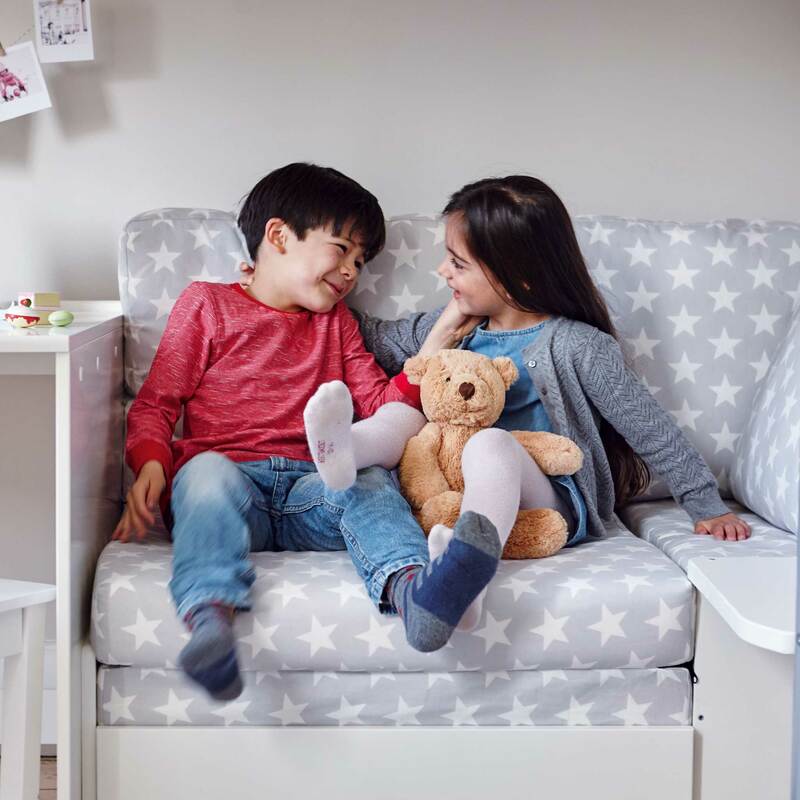 A high sleeper bed is a magic idea for older kids; the accumulation of friends and increased academic demands make a spare bed and a desk absolutely essential(our coordinating Nelson Desk Chairwill also come in handy).The sofa seat makes a cosy nook during the day, but converts into a sofa bed faster than you can say 'sleepover'. 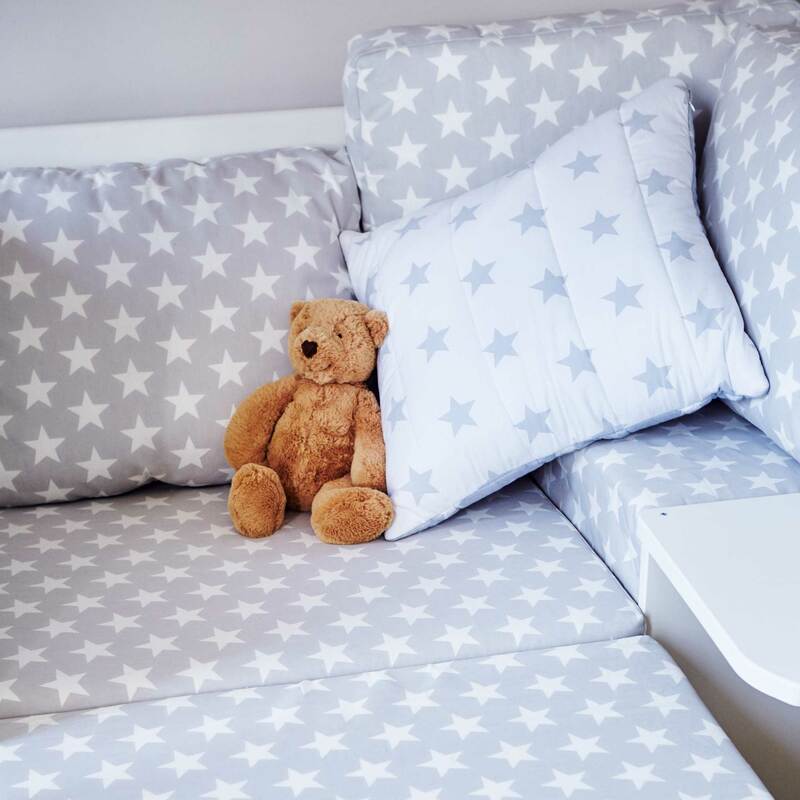 This bed is also available with either a Pink Star sofa bed or a Navy Star sofa bed. Made with a pine slatted base and a solid wood frame with MDF panels, painted in Chalk White. Includes desk, sofa bed and a clip-on bedside table and sofa bed cushions with 100% cotton cover. Bed frame tested to British Standard BS EN: 747; suitable for 6yrs+. Includes 5 Year GLTC Warranty. Assembly service available (£100). Washing Instructions:Cushion covers are spot clean only, due to the flame resistant finish on the reverse of the cover fabric. This complies with Furniture & Furnishings (Fire) (Safety) Regulations 1988.